I went to Nerdcon this Saturday! I had an unfounded belief that it was going to be two booths and some guy selling toys he found at the Goodwill but thankfully it was not. It was huge and had three different zones for vendors, two stages (one for concerts and one for panels), and even lightsaber fighting lessons. When I had started this blog, I had originally planned to travel to as many niche conventions I could find and I am proud to finally do that and here it is. When I arrived, I luckily grabbed one of the last parking spots. The massive amount of cars and the plentiful families packing strollers and corralling costumed kids gave me the impression it was going to be busy. I was right. The line reached across a bridge that lead from the center to the parking lot. Arriving late was an awful idea. and my favorite, the non-sequitur cosplay suggestions of the bro that was too cool to be at nerd con; such as (and these are real suggestions) a fire hydrant, a bottle of Sailor Jerry’s Rum, Scorpion from Mortal Kombat, and Hitler. Although I began to seriously regret my decision to come, when I got into the convention my mood changed. The entrance led to a room full of vendors selling comic books, toys, and collectibles. There was an outdoor patio that had a metal band dressed as characters I did not recognize and then a huge Ogre looking creature came walking buy (pictured above). I knew I had made the right choice to come. 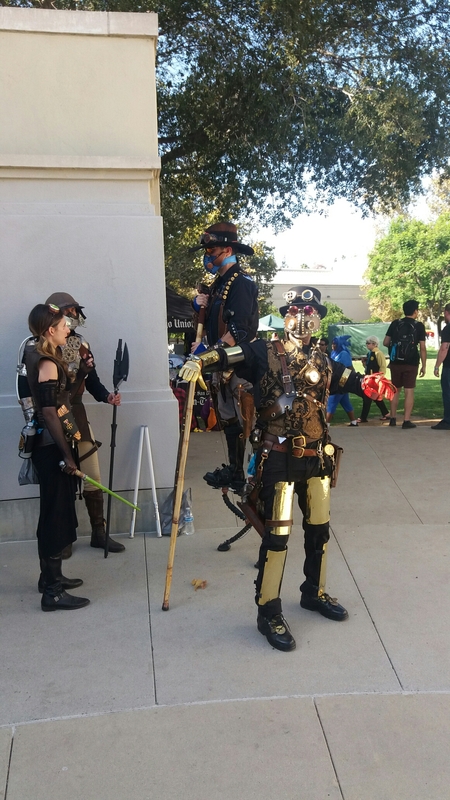 I meandered through the halls and out to the main grassy area that led to the different “zones.” I was blown away at the cosplay, I really had no idea so many people dressed up and not only dress up but put a lot of time and energy into these costumes. It was impressive. I crossed the green and into “zone 2” which contained a bar and awful karaoke renditions of video game songs and 80’s synthpop, it was glorious. Inside they had 4 levels with vendors on each one. I found my holy grail, a nice lady selling rare playing cards. As an amatuer magician, my heart leapt and I bought a very expensive pack of “Bicycle British Monarchy” playing cards. On the top floor were row upon row of video games set up so you can battle your friends. I found Street Fighter and I am proud to say I beat two strangers before being dethroned. I was in heaven. I walked around for a bit after that. I caught the voice actor’s panel and was very entertained with their script reading of Pulp Fiction in Smurf voices. I lost it when one of them said “Is there a sign in my yard that says dead smurf storage?” I checked out the rest of the convention and all of the other vendors. I got a couple pictures of some awesome costumes and I decided to go refuel with some coffee at the Black Kettle on Grand Avenue, one of my favorite cafes. After my quick lunch, I made it to the cosplay contest. This turned out to be the best part of the convention. Anyone who dressed up could compete. The costumed people made their way on to the stage and a group of professional cosplayers (apparently it’s a thing) and costume designers from Los Angeles judged it. It was a lot of fun and there were some very inventive costumes. There were at least 30 costumes so I am just going to upload my favorites starting with the winners. (1st place on the left to 4th place on the right). ft and Dana Nukem (Lara Croft and Duke Nukem with genders switched). Overall it was a great convention and I had a wonderful time. I did check out the Niantic panel (I am a huge Pokemon Go nerd) and it was disappointing. They said that whatever is coming for PoGo is closely guarded and are not allowed to talk about it. They then continued to talk about how great they think Ingress is and how exciting the future is in very broad terms. It was annoying and a complete waste of time. I did catch a charmander during the talk, so it was not a complete waste. I took a couple more pictures of some great costumes (including one girl who looked exactly like Rey from Star Wars) and called it a day. Thank you for reading my first convention post. I had a great time and look forward to finding more to attend. If there are any conventions you know of that are in or around Southern California please let me know about them. You can tell me about them on twitter @WanderingDorkie or you can email me at JamestheWanderingDork@gmail.com. *If you have made it this far thank you so much. I put many hours into this post and I appreciate you reading it. I would love it if you like, share, and follow this post and if you really want how about coffee? Thanks again.